Our newest additions, these cameras provide a Full HD 1080P video stream over a standard RG-59 or RG-6 coaxial cable. They are ideal for upgrading older security camera installations where you need higher quality, without having to run new cables. 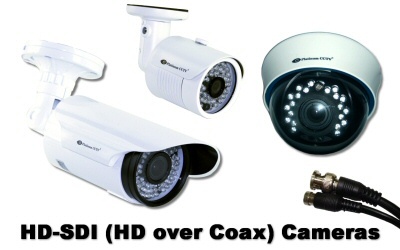 These cameras are designed to operate with HD DVRs (HVRs), and are best when used with our AVM HDVRs. Each of these cameras have infrared night vision and come in indoor and outdoor models to suit your installation needs.